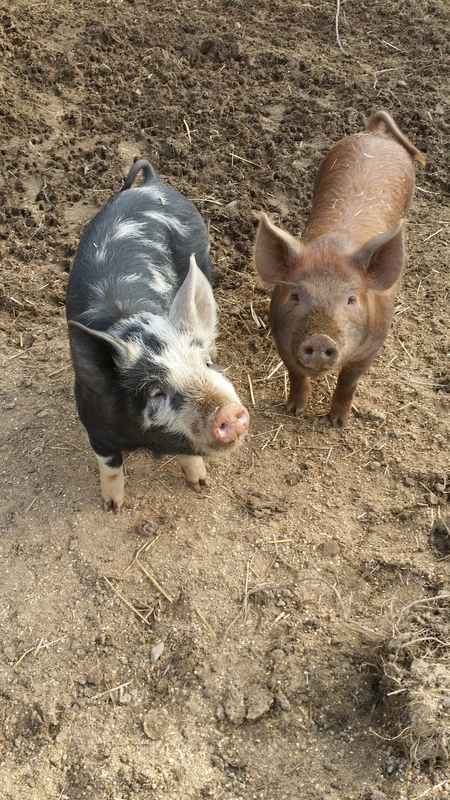 Bitsy and Dixie have been flipping over their feed trough on a daily basis. I didn’t think this was such a big deal because pigs like to root, and I just figured they would root around on the ground and eat up the spilled mash. I was completely wrong! They left it on the ground, and it rained on it, and then we just were left with a big five foot wide and three or four feet long stretch of nasty mash all over the ground in their pasture. Yesterday, Ted and I went on a date together, and we did our normal farm date: we went out to eat for lunch, and then we spent a couple of hours wandering around in Rural King. 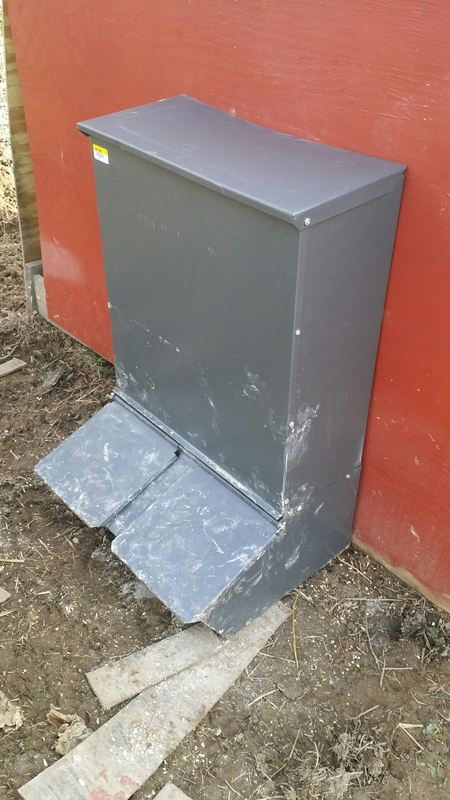 While we were there, we ran across a double hog feeder, and it was a lot cheaper than we had seen it anywhere else! I found a cart, and Ted loaded that baby up! He went to the house and got some scraps, and he threw those into the hog feeder, and we waited… He took a stick and pushed the lid up and down so the pigs could see the food in it. Dixie was super interested, and she was very curious, but there was no way she was going to stick her head inside that feeder and not be able to see around her. Betsy was having nothing to do with any of it. She just kept going back to the feed trough and marching around and around the Pink Palace, snorting and oinking and squealing and making her dissatisfaction well-known with both of us. 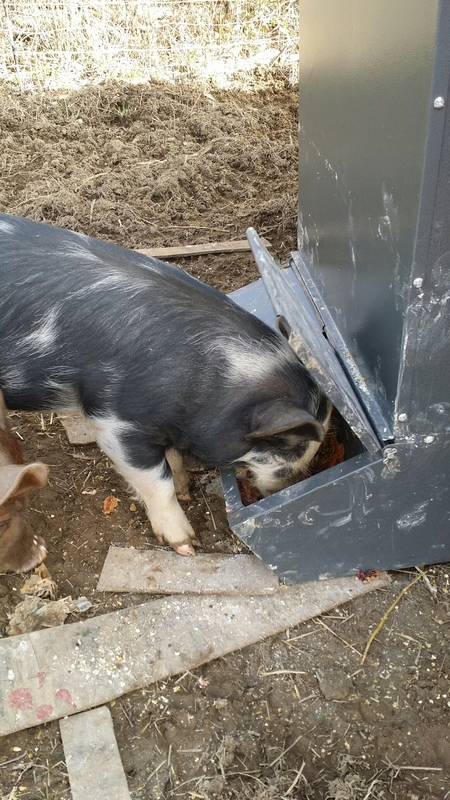 He propped open the little doors, thinking the pigs would stick their faces in and start eating all of the food. Dixie stuck her face in, knocked the sticks out of the door, and ran away when the door slammed shut. Finally, we gave up, and we went inside the house. 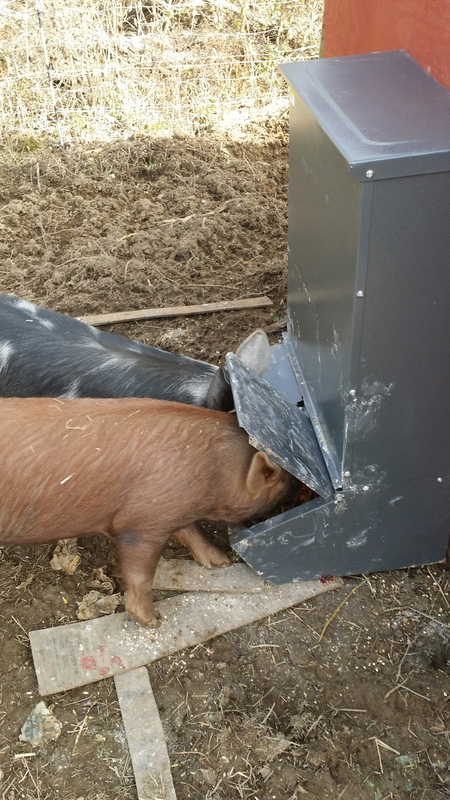 All evening long, we could hear those little doors slamming down so we knew the pigs were trying to figure it out. This morning, I had three pies left over from Christmas Day that were not any good so I decided to give them to the pigs. I put them inside the new feeder and smeared a little of the blueberry pie around the door and the side of the feeder. In just a few seconds, Dixie had the feeder open and was eating her fill. Pigs are competitive eaters, so Bitsy was not about to let Dixie have all of the pie to herself. After a couple of minutes, she figured out that the doors were not going to eat her when they slammed closed, and she figured out that nobody was going to bother her while she was eating so they both ate and ate their fill this morning.